Checking up Facebook on a Sunday morning, I noticed a message by JuJu asking if anyone wanted to do a buffet. Slightly intrigued, I questioned what did he have in mind. 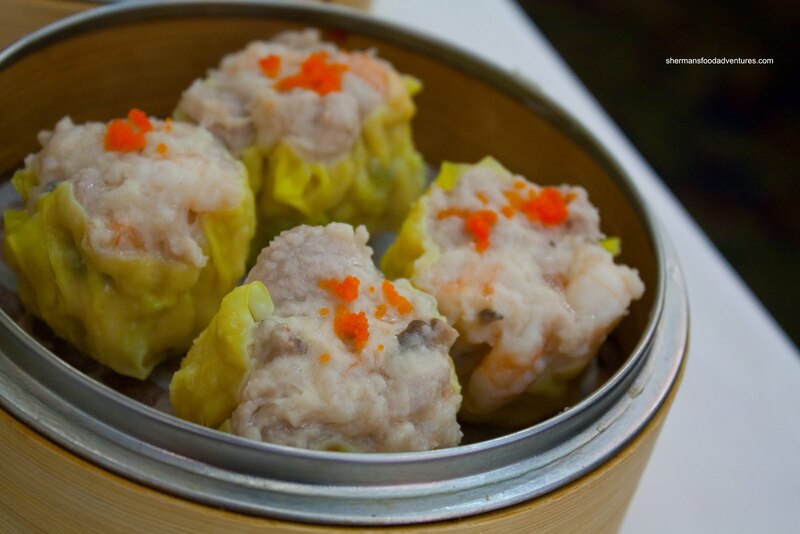 Soon after, he declares that he felt like Dim Sum and wondered who was in. Me, me! Pick me! As if there was any doubt about it. So on my way out to run some errands, I met up with him to do a quick Dim Sum lunch. But where? We've been to so many of the usual places already. First, we tried our luck with Chong's on Kingsway. Upon arrival, we discovered that they were closed. We briefly entertained the thought of Come Along a few doors down; however, we didn't feel like Come Along together... Ahem. 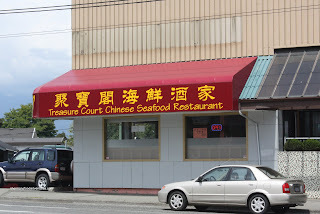 Rather, we drove down Kingsway and ended up at Treasure Court. Formerly King's Garden, then Delicious Chinese Cuisine, the signage has only been recently changed. Both former names were on the front of the restaurant prior. I guess they didn't want to waste the Chinese portion of the sign (they have since removed them). Reminds me of Golden Pizza and Sandwich out in Surrey. As expected, there was a slight wait. When a table opened up, JuJu immediately occupied the seat away from the window. As I have said over and over again, I am so lucky to have such cooperative eating companions! He wanted to make sure I got good lighting for my pictures. He's a keeper! As for the food, we predictably started with the ying and yang of Dim Sum being the Haw Gow and Sui Mai. 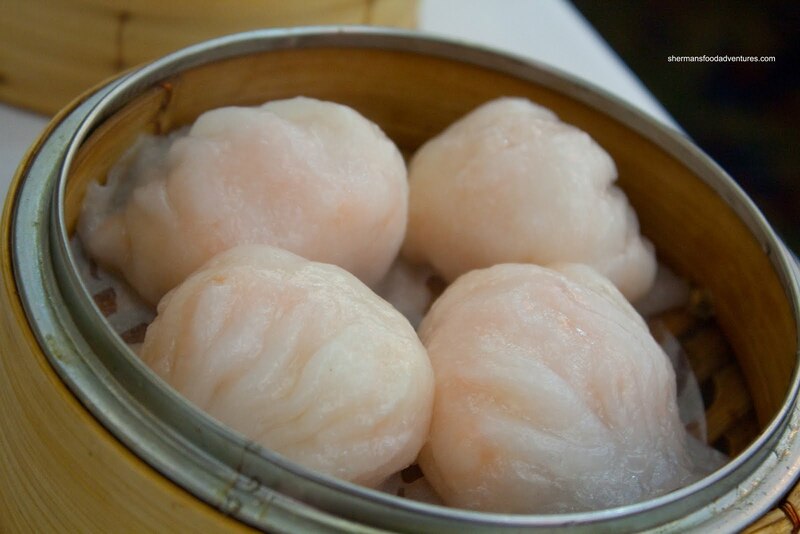 If there was even an award for the biggest shrimp dumplings, these would definitely be in the running. The darn things were absolutely massive. And to top it all off, they were prepared nicely. There was big chunks of cold water shrimp which were well-seasoned. The dumpling wrapper was not gummy nor too thick. Really good value. The sui mai was equally impressive. 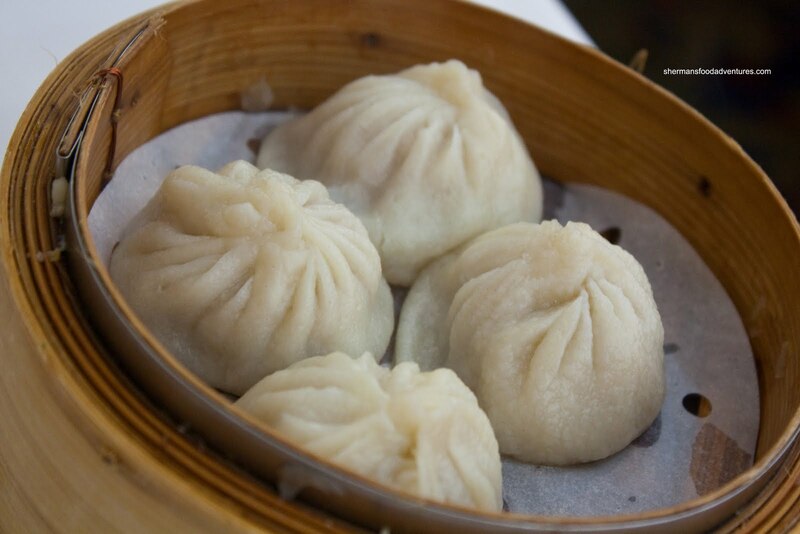 Just as large as the haw gow and filled with perfectly texture pork and shrimp, we were wondering if we could finish the food we ordered based on our first 2 dishes! 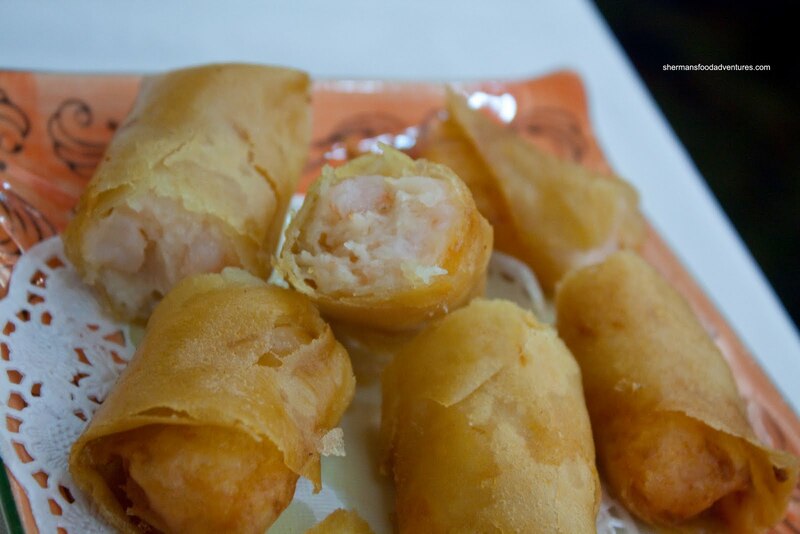 If we thought the haw gow had a lot of crunchy shrimp, then the Shrimp Spring Rolls had just as much. I don't think I've ever seen so much shrimp crammed into a spring roll before. What was more impressive was that the shrimp were in very large pieces rather than a mousse. In addition, the shrimp was sweet and seasoned properly. The only thing that bugged us was the oiliness of the whole thing. Check out the oil slick at the bottom. Next up was more shrimp in the form of the Shrimp Rice Noodle Roll. As you can clearly see in the picture, the rice noodle is quite thin. In fact, it was both thin and perfectly textured. It was soft while still exhibiting a slight elasticity. Inside, there was large whole crunchy shrimp along with some yau choy. 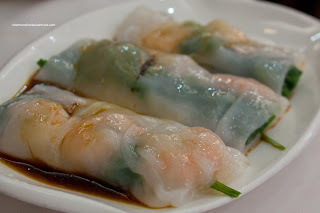 For me, I personally don't like the addition of greens in rice noodle rolls. I find it messes with the texture. Other than that, the rice noodle roll was one of the better ones I've had lately. Once again, JuJu insisted on ordering the Xiao Long Bao. 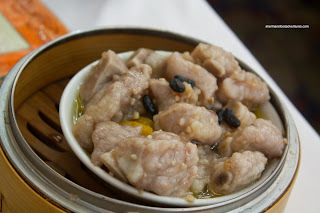 Shanghainese food in a Cantonese restaurant is never a good idea; but I gotta admit that these were acceptable. Sure, the dumpling skin was too thick and yes the amount of soup was meager. Yet, we went in with reasonable expectations and they were not horrible. The filling was actually quite tasty and not gritty. No shortage of meat flavour. Could've used more ginger though. 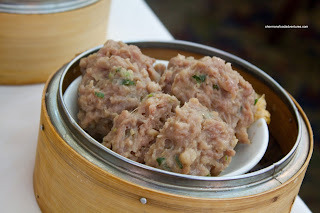 Of course, whenever I go for Dim Sum, I need to have my balls. Beef Meatballs to be exact. Generally, it is good that the meat is pureed until smooth and tenderized until it has a bouncy-like texture. I would say the one here was probably over-tenderized. It is true that the meat in this particular item usually takes on a very non-meat-like texture; but this was too "airy". Therefore, it was lacking body. Flavourwise, it was slightly on the bland side too. But then again, I dipped it into Worcestershire sauce anyways. For me, I got the Blackbean Spareribs as usual. Since JuJu and I have our own favourites, I think I ate most of the spareribs. I had no problem with that since they were very good. By looking at the picture, it is quite obvious the whole thing was mostly meat with very little in the way of cartilage or fat. Taste wise, it was very garlicky - exactly how I like it. In terms of texture, it was marinated just enough to easily chew. Lastly, we ended off the meal with a filler. We didn't plan it this way; but it came last. Too bad since we were pretty full already. 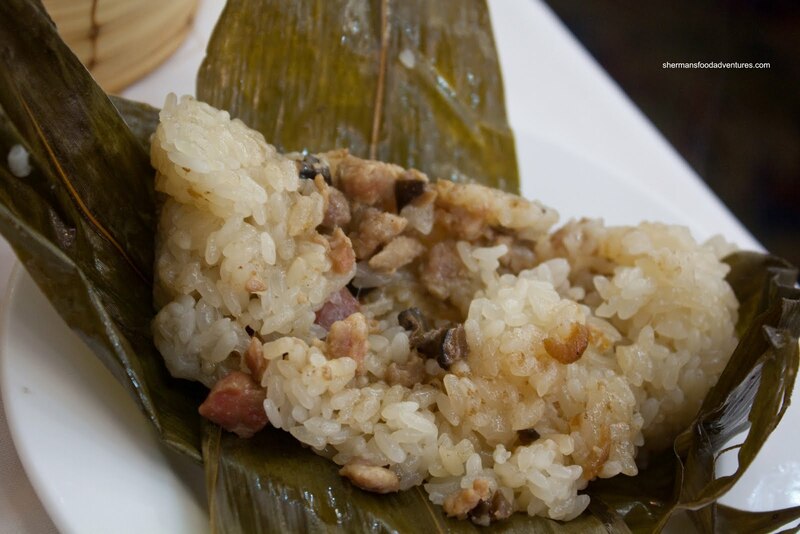 Since we are committed to our eating, we the Loh Mei Gai (Sticky Rice wrapped in Lotus Leaves) anyways. I found the sticky rice slightly on the drier side; but the pork filling seemed to soften it up onced mixed. Furthermore, the filling was well-seasoned, which in turn made the rice taste good too. @Toreiishi No worries. Errors happen. No one is perfect.